Use the Magicians Tape to tape off your magic props while you set up. 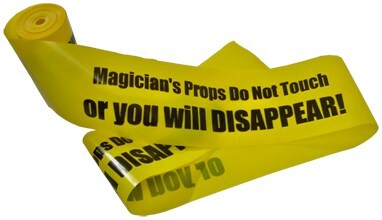 The Magicians Tape sends a clear message that says "Magician's Props DO Not Touch or you will DISAPPEAR!" How many times either before or after you set up do you get people coming up and handling or touching your props without your permission? With the "Magicians Barricade Tape" it sends a clear message in a funny and straight forward way that will get your point across.